Years Of ExperienceWorking with business data since 2008.
Business Data KnowledgeOctostream platform processed hundreds of data sources. Data VolumesWe have processed more than 350 Terabytes of data. Metrics and InsightsOver 2500 business metrics built for our customers. We add analytics and data visualisation capabilities to our clients' data. 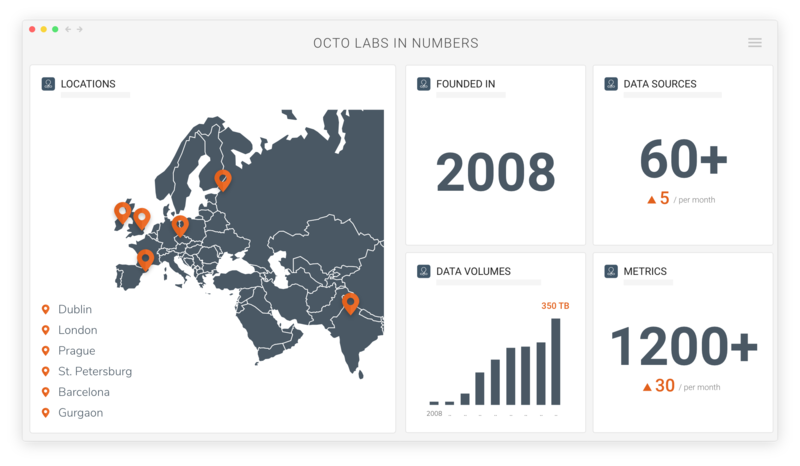 Some of our technology was used to create Octoboard business performance dashboards and marketing reports. We connect to any cloud data source and run analytics modules in real-time for businesses worldwide. Our team works with international clients. We add value to business data by turning idle datasets into insights. We are distributed teams working with businesses around the world. We are highly motivated because we hire motivated people. We do not have heavy corporate structures or overheads. We believe in small teams who make decisions and work closely with customers.